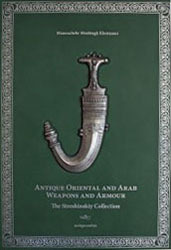 The book «Oriental and Arab Antique Weapons and Armour: The Streshinskiy Collection» сconsists of 334 pages, which depict 140 wonderful articles of Muslim weapons, the works by the best armourers and jewelers. There you can find ascriptions and historical descriptions of weapons of Iran, Turkey, India and Arabian countries. The book is one of the best-illustrated publications of weapon catalogues.